I'm usually pretty good at buying presents. They usually just pop out at me as I'm wandering store aisles or perusing the internet. Usually, it's way before I actually need to have a present. Casey's birthday isn't until the end of May and I've had his present for a week, now. I'm afraid all that good luck is at an end. Raw's birthday was Saturday and I didn't have her full gift lineup until Thursday. And I wasn't satisfied! Yeah. I'm totally not kidding. Lamest present ever, right? It's not like I came up with it all by myself. I told Raw a few weeks ago that I was having trouble finding a present for her. 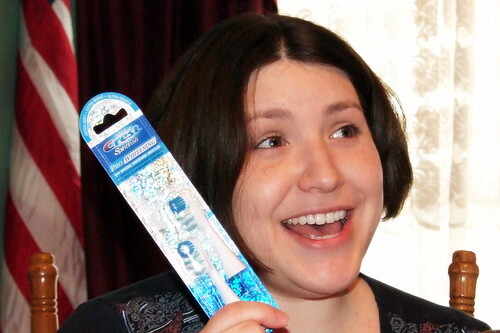 "I want a Crest SpinBrush toothbrush with replaceable heads." "And so it will be." But how could I just get her a toothbrush. For weeks, I searched all over, trying to find something cool to get. I was going to get her the Nike + iPod Sport Kit, but found out you have to have the shoes, too. "Here's your present! I bought the cheap part! Now you get the shoes! Happy Birthday!" I even thought about giving her a hundred dollar bill, but cash is so tacky . . . Instead, I freaked out and just stocked up on dental care products. If it's clean teeth she wanted, clean teeth she would have! As she was opening her presents, I sulked. "I'm sorry it's such a lame present." "Are you kidding? It's awesome!" I'm thinking maybe toothbrushes are cool to give as presents. So now everyone's getting one for their birthday! Go clean teeth! Besides, at some point...your memories, your stories and adventures, will be the only things you'll have left. You will always be my Boo!